DO YOU DREAM WALKING INSIDE A PAINTING? Imagine yourself at an art gallery... You get closer to Claude Monet´s "Bridge over water lilies pond" painting and magically is transposed to it! A SHORT, SIMPLE, CONTEMPLATIVE EXPERIENCE FOR FINE ARTS LOVERS! A FUN WAY TO LEARN ART. Our purpose is to STIMULATE VISITING to Museums and art galleries. * Playing time: Aprox. 15 minutes. OUR PURPOSE IS TO SPARK INTEREST IN ART FIELD AND EDUCATION THROUGH GAMES AND IMMERSIVE EXPERIENCES. 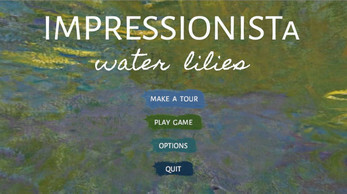 THIS VIDEO SIMULATES IMPRESSIONISM BRUSHTROKES AND A SMALL SECTION OF MONET´S GARDENS AT GIVERNY. WE ARE PLANNING A SERIES OF "PAINTING" MINI-WORLDS for 2017. *Gigoia Studios is very aware that digital imagery can´t compare with real painting artwork. - A virtual 3D Art gallery space. - Reconstructed painting in 3D with beautiful pond reflections and vegetation in Impressionism style. Walk around the place, enjoy vivid colors and live brushstrokes. - Dreamy Soundtrack for harps and flute. - "Make a Tour" mode, so you can just watch an automated walking. - 4 ORIGINAL SOUNDTRACKS from IMPRESSIONISTa, FAUVISTa and ART GALLERY. Was running this at a party for frieds, and it impressed people! We ran through several of your programs to wander through different art. I am very happy you and your friends liked it! If you like to share some photos of the party and the gameplay, If you dont mind, I can post on Gigoia Studios social media channels and website. We don't have any pictures (yet), but I will keep it in mind as we do a gathering a month! And I am following you already! Also been replaying this again. I'd like to make a suggestion - make a variant of "Take a tour" that loops - as soon as you get to the end, you turn around and do it again. This game and others would just make lovely background. Lovely job. As I wandered, I realized that I was experiencing Monet's gardens all these ages later, AND in a way seeing them as he would have. Quite an experience! Monet gardens at Giverny is sooo awesome, a true dream! I hope to see them sometime. My girlfriend was interested in them, so I showed her your creation (along with some interested friends). PC, mac or Linux ? If Linux, it's not tested , sorry. But PC and Mac works fine and fully tested in a lot of computers. Oh, wait, never mind. I used the wrong one. Hi kplasa, thank you so much ! We are improving upcoming art games, with more environmental effects and brushstrokes, etc. Incredible experience! The idea is fantastic!!! The visual are awesome pretty!